The full price will be $14.99 but it will be on sale for only $9.99 the first week after launch, and the price includes 10 complete character decks. Read on for all the latest updates in this version of Yomi, or check out this post on Designing Yomi to learn more about the game itself or this post about Game Balance and Yomi to see what goes into balancing hundreds of matchups. 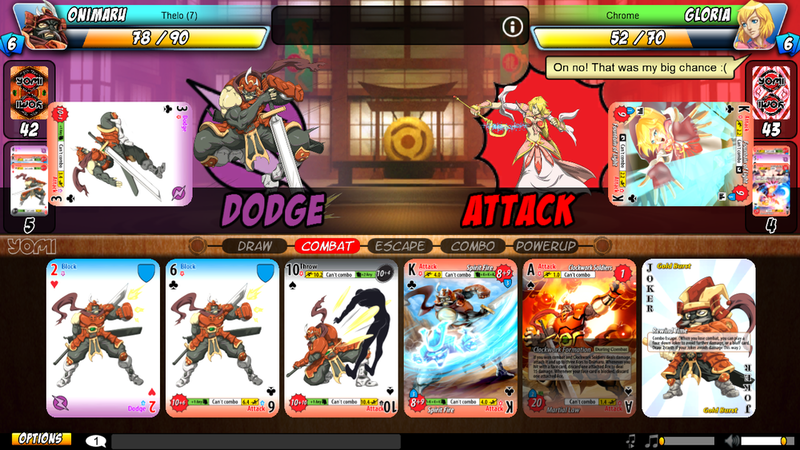 Yomi is a fighting game in card form and it's the competitive card game you should be playing. Just like in a fighting game, you have to learn your character's strengths and weaknesses, read your opponents' tendencies, and land combos when you can. Yomi is highly balanced at the expert level, and it expresses the values of a fair competitive game. You always have a full strength deck on an even playfield with your opponents. Yomi has 20 characters, each with their own unique abilities and playstyles, leading to a whopping 210 different matchups. Yomi is packed with features. Cards have 4x the resolution as the web version! Yomi on Steam has a bunch more features such as inscribed cards, gold cards, EX characters, and saving/viewing of replays. You can read more about the Steam version's features here. Don't miss the launch on May 8th!